Subcommittees in both the Iowa House and Senate have endorsed a legislative response to complaints about two large energy projects that would stretch through hundreds of Iowa properties. Lawmakers have been fielding complaints about a pipeline that would carry crude oil from North Dakota through Iowa and about the Rock Island Clean Line project to carry wind power out of Iowa, to the east. John Murray of Storm Lake said his mother’s been pressured by land agents trying to acquire the rights to a path through her Buena Vista County farm. “We felt somewhat undersized against the oil pipeline company,” Murray told lawmakers during a statehouse hearing yesterday. If the bill that has cleared initial hurdles in both the House and Senate becomes law, companies planning pipelines or electricity transmission projects would have to obtain permission from 75 percent of affected landowners before the state could grant the companies eminent domain authority to acquire the rest of the land. Jeff Boeyink is a lobbyist for the company that wants to build the pipeline that would carry crude oil from North Dakota through 17 Iowa counties, en route to Illinois. 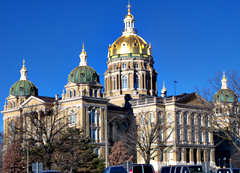 “We oppose retroactive changes to Iowa’s eminent domain statute,” Boeyink told legislators. Eminent domain authority to seize land can be used for projects with a public purpose, but critics say these projects are about private profit, not public good. Senator Rob Hogg, a Democrat from Cedar Rapids, said members of both parties have concerns about these projects. “We need to fill the holes in Iowa’s law to make sure that we’re not turning over the power of eminent domain to private companies,” Hogg said. The Rock Island Clean Line Project would cover a 375 mile route through Iowa, starting in northwest Iowa and exiting the state just north of the Quad Cities.